We are trying to locate "vets" from the 70's when the site reopened .... your help would be appreciated. Thanks to Gene Looram, Archie Justice and Brad Oberklaus who have contributed. 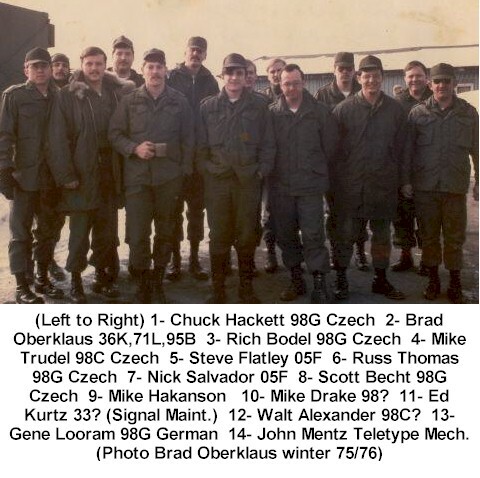 Click here to send any comments, feedback or information you might have to locate or identify those who "survived" Schneeberg in the 70s .... I understand the site went back to being temporary and "mobile". Wow! Thanks Tom for the quick feedback .....Hope we can identify all the folks. 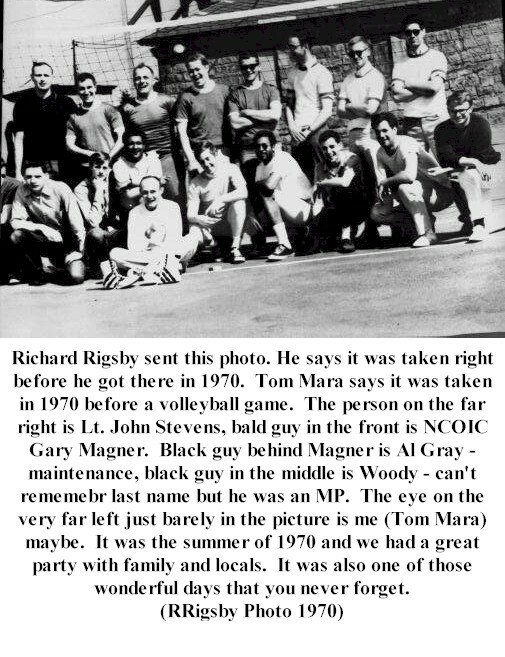 The photo taken in 1970 was for a volleyball game. The person on the far right is Lt. John Stevens, bald guy in the front is NCOIC Gary Magner. Black guy behind Magner is Al Gray - maint., black guy in the middle is Woody - can't remember last name but he was an MP. The eye on the very far left just barely in the picture is me (I think). It was the summer of 1970 and we had a great party with family and locals. It was also one of those wonderful days that you never forget. 4. 98C married with young baby, found alcoholic former postman lying dead in his living room. Rented from daughter of dead postman. Scott was probably holding the camera. Don't know where the other 10 people are. The shed behind us was torn down by a German who hauled it away in Spring '76. Only bldg we could use was old single car garage. We worked out of vehicles for over 2 years. Site was primitive. Germans were pissed that we were back because the site had been promised to them before Freeze decided to use it. Hope this helps. Message: Great web site Phillip. I was there from approx. Jan 76 to Jan 77. As EHL mentioned earlier Det S reopened sometime in 1976 to be permanently manned. I was one of the original 25. Since there were so many MOS's to be filled by only 25 people those with multiple skills were selected. I was a 36K "wire commo" who could speak some German and had some typing skills. I also spent some time as an MP back in Augsburg, Flak Kassern. These skills meant I spent alot of my time on guard duty and typing for EHL. If memory serves me correctly, I in fact took this picture. This explains why I am in the #2 position reading from left to right.